To bring us into the weekend, I thought I’d share one of those wonderful old-fashioned Jewish dishes– you know, the sort of dish that warms your tummy and your heart. It’s the kind of cooking that brings back memories of Bubbe in the kitchen, making her family recipes from scratch with a “pinch of this” and a “handful of that.” I never had a bubbe (mine were both called “grandma”), but if I had I’m sure this soup would have been one of her favorite recipes. I’m talking about homemade Chicken Kreplach! Kreplach are stuffed noodle dumplings, a Jewish dish that has been around since Medieval times. Kreplach originated in Eastern Europe as fried pastries stuffed with meat, known as krepish. In the 15oo’s krepish evolved into stuffed pasta; the shift was likely inspired by Italian or Asian influence in the region. The dish became popular throughout Europe under different regional names (varenikes in the Ukraine, pierogi in Poland, agnolotti in Italy). In Eastern Europe and within the Yiddish community, they became known as krepl, which evolved to the plural word kreplach that we use today. It’s now considered a quintessential Jewish dish that has become standard fare on deli menus across the country. Kreplach are generally served in a bowl of soup broth, but they can also be served on their own, like dumplings. Cheese kreplach are often topped with sour cream. My husband grew up eating kreplach topped with chopped walnuts, a tradition handed down from the Russian side of his family. They can even be stuffed with fruit or preserves and served as dessert. 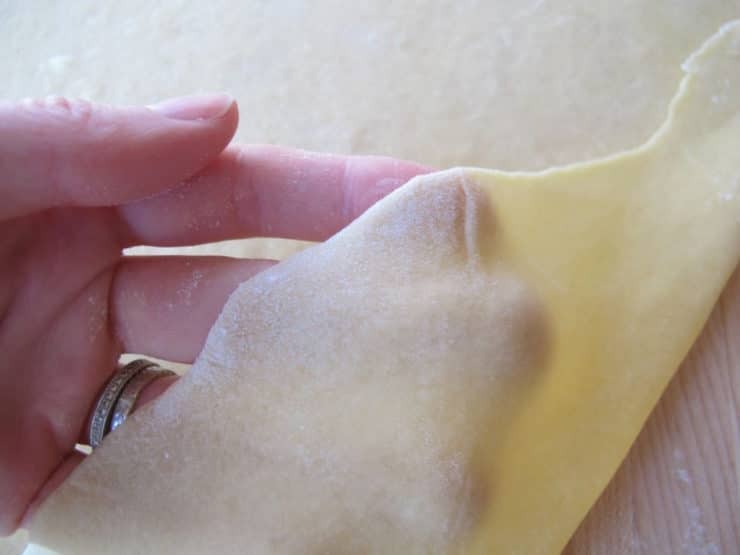 My kreplach recipe is an adapted version of my mom’s homemade egg noodle recipe, with a little oil added to the dough for flexibility. 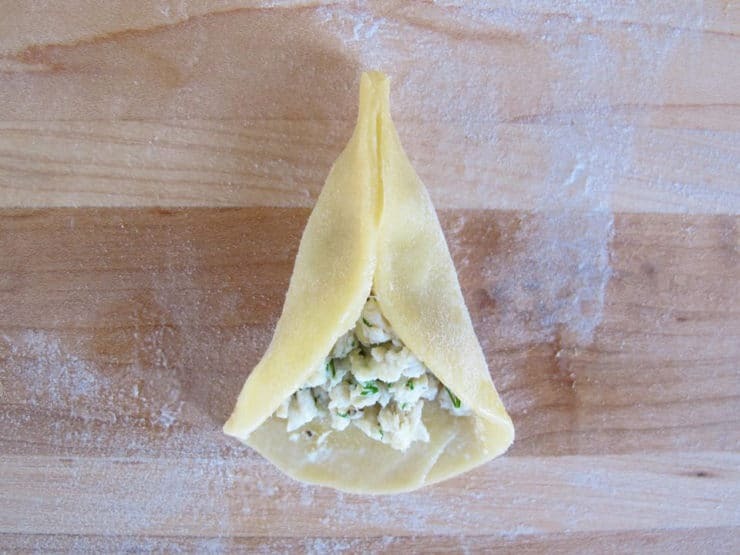 They’re stuffed with a basic chicken kreplach filling– minced soup chicken, herbs, chicken fat and onions. I fry the onions to caramelize them and bring out their flavor before adding them to the filling. My herb of choice is dill, because in my family we’re dill fanatics. If you’re not a fan, you can substitute fresh parsley instead. And I always add a touch of the skimmed chicken fat from the broth for moisture and flavor. If I’m feeling naughty, I throw in a little of the fatty chicken skin. It might sound weird, but when ground in with the filling the fat produces a silky texture and adds a ton of flavor. Did you know that kreplach can also be fried? 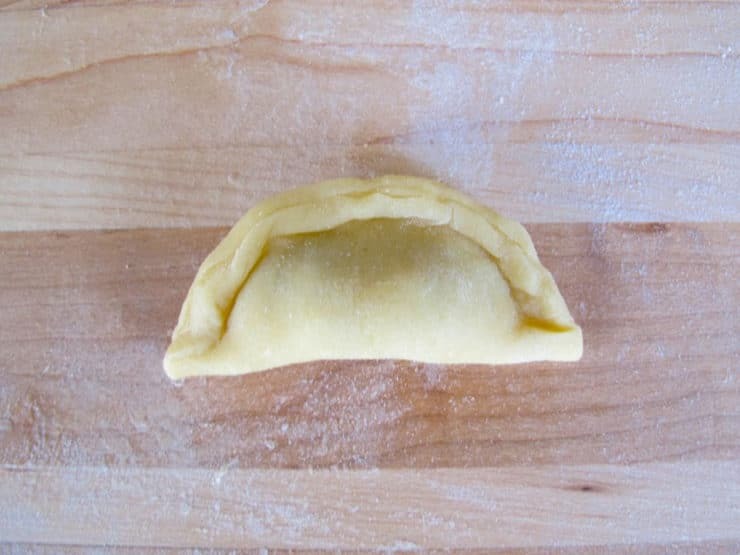 Frying stuffed kreplach creates little mini pies that are similar to empanadas. They are totally delicious, and they make fun appetizers for a party. I usually fry them in vegetable oil; if it’s a meat filling and you’re feeling indulgent, you can fry them in schmaltz for even more flavor. Instructions are provided in the recipe below. Before you tackle homemade kreplach, keep in mind that this is a Sunday kind of project– it takes time. It’s also messy. Wear an apron, and prepare to get flour everywhere. I’ve provided step-by-step instructions with pictures to help keep you on track. It’s a long process, but it’s definitely worth the time and effort. Because it is a laborious process, kreplach are usually reserved for special occasions and holidays. They are traditionally served on the evening before Yom Kippur, the seventh day of Sukkot, on Purim, and on Shavuot (Shavuot is a dairy holiday, so cheese kreplach are usually served then). 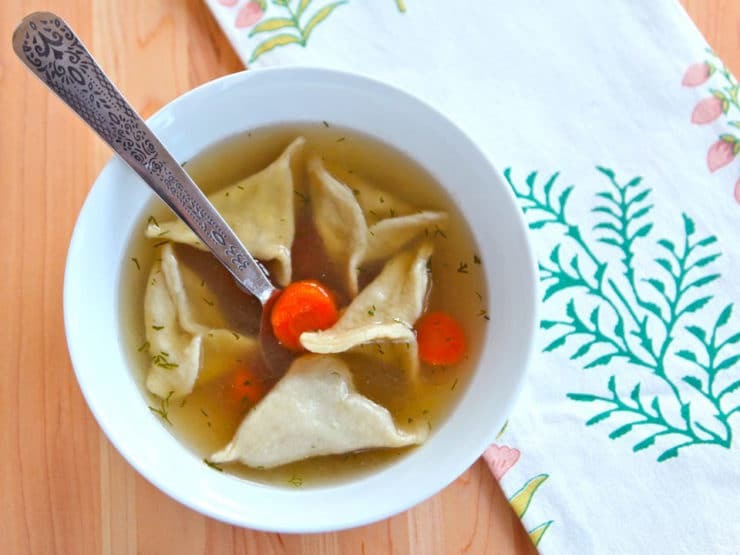 If you’re looking for an easier way to make kreplach, my friend Bella Hadar gave me the tip of using won ton dough– you can find it in the refrigerated section of most grocery stores. It won’t taste like homemade, but it’s a workable sub if you’re in a hurry or don’t have the patience to roll out the dough from scratch. This is one of those dishes that just feels good to eat. 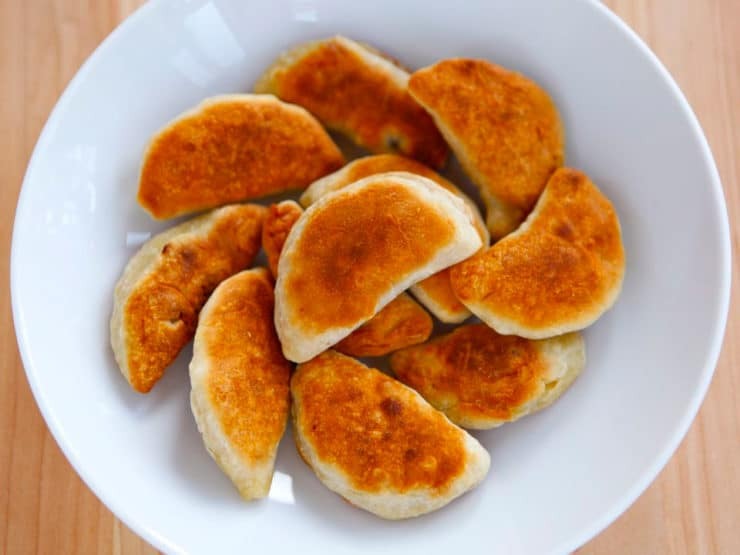 There is a popular Yiddish expression, “Kreplach esn vert oykh nimis,” which roughly translates to– “One even gets bored of eating kreplach.” It’s the Yiddish equivalent of the American phrase, “Too much of a good thing.” Kreplach really is a good thing. Really really. And it’s hard to imagine having too much of it. So go on, make some kreplach! 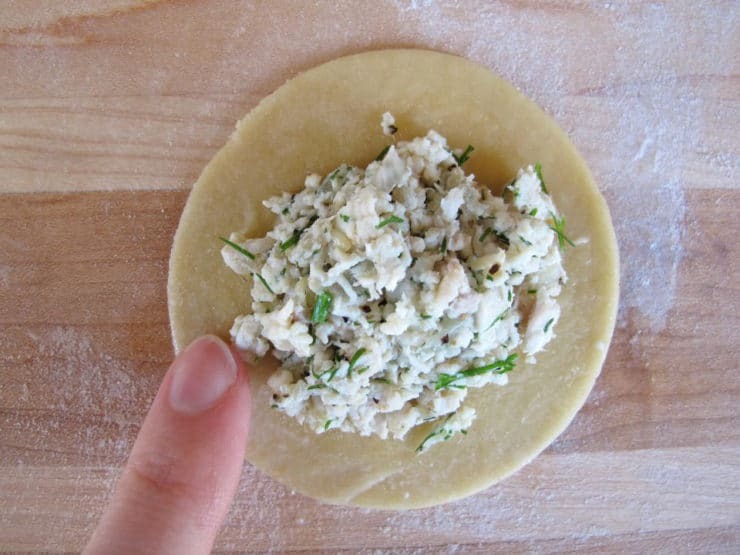 Make old fashioned Chicken Kreplach from scratch - recipe with step-by-step photos. Deli-style soup dumplings just like Bubbe made. Kosher, Meat. Replenish the liquid that was removed during scumming with hot water (it's usually around 1-2 cups). Do a final skimming to remove any leftover foam. 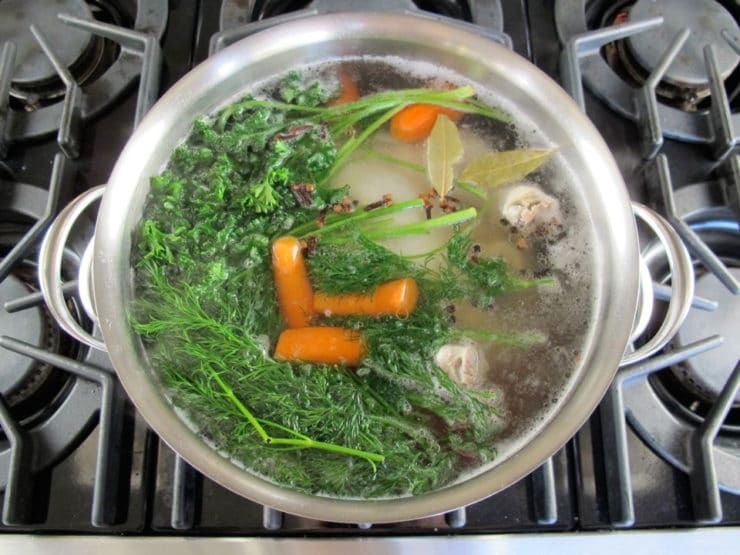 Add the carrots, celery, parsley, peppercorns, cloves, and half the fresh dill to the pot. 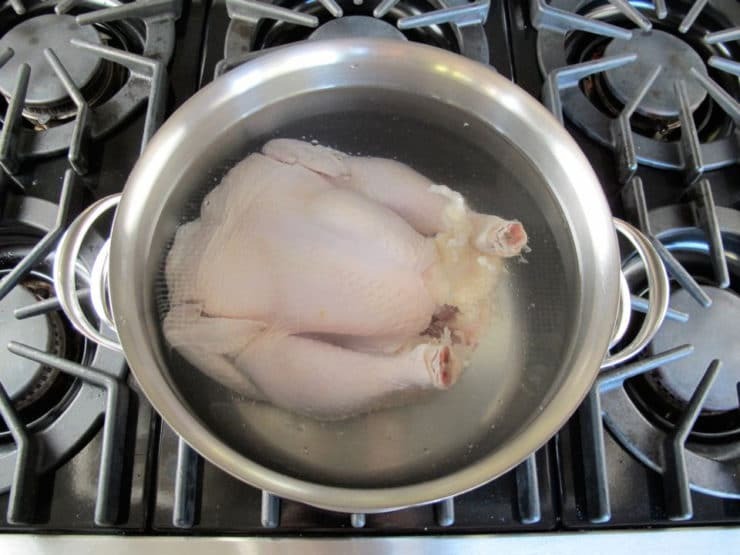 Add 2 tsp salt to the water (if you're salt sensitive or using a kosher salted bird, salt less). Bring back to a boil. Put the lid on the pot and vent it. Reduce heat to medium low so the soup is slowly simmering. Let the soup cook for 90 minutes. While the soup is cooking, mince up 1/4 cup of the remaining fresh dill and reserve. Heat 2 tbsp of corn oil in a skillet over medium heat. 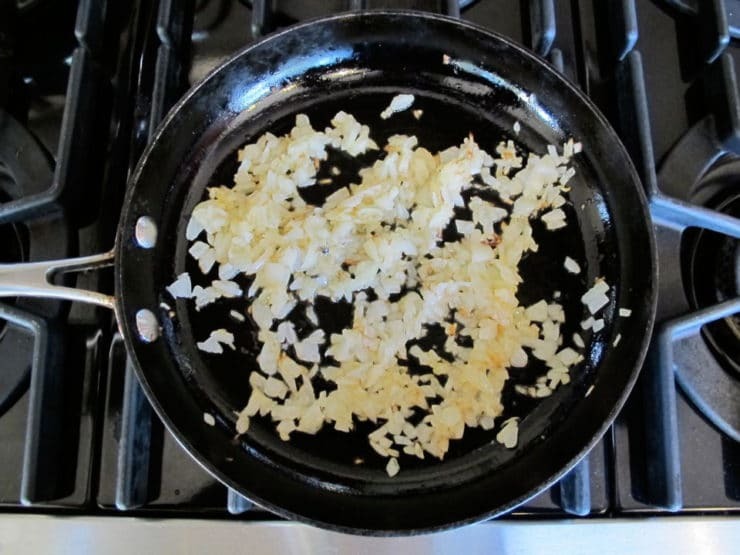 Place the diced onion into the skillet. Let it fry for about 10 minutes, stirring occasionally, till the onion turns golden brown. Remove from heat. Reserve the onions and oil in the skillet. After 90 minutes of cooking, when the chicken is tender, turn off the heat. Use a pair of tongs to carefully pull the chicken from the broth. Put it on a plate. Taste the chicken broth and season with additional salt and pepper, if desired. Allow the chicken and the broth to cool. Meanwhile, make your kreplach dough. Beat 3 eggs and 3 tbsp of the corn oil in a small bowl till frothy. Reserve. Sift 1 1/2 cups of flour with 1 1/4 tsp of salt into your mixing bowl (if you're salt sensitive or on a low sodium diet, use less). 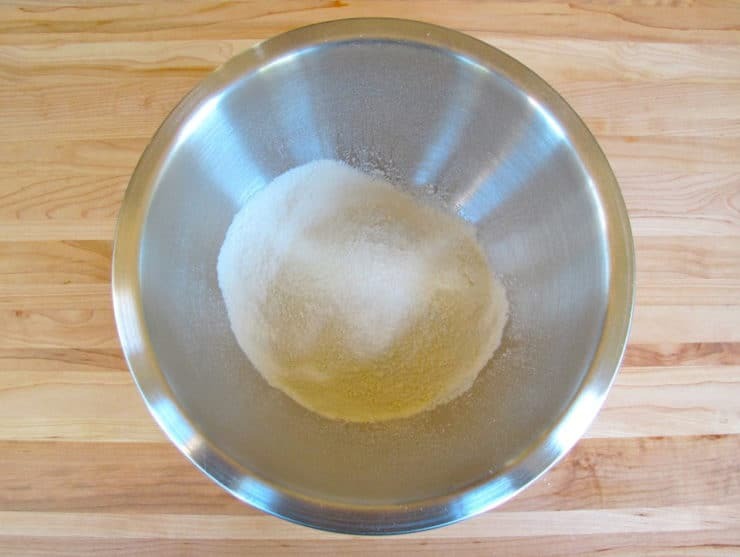 In your mixing bowl, make a “well” in the center of the sifted flour and pour the beaten eggs in. 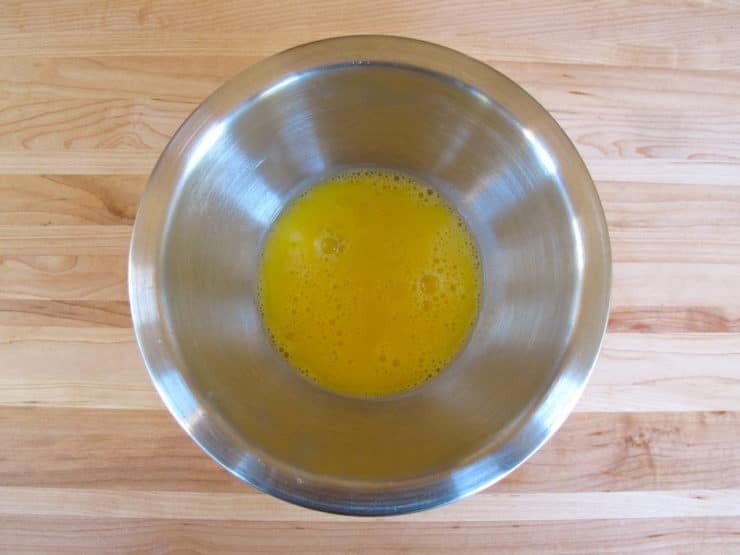 Use a fork to mix the eggs into the flour until it is evenly moistened. 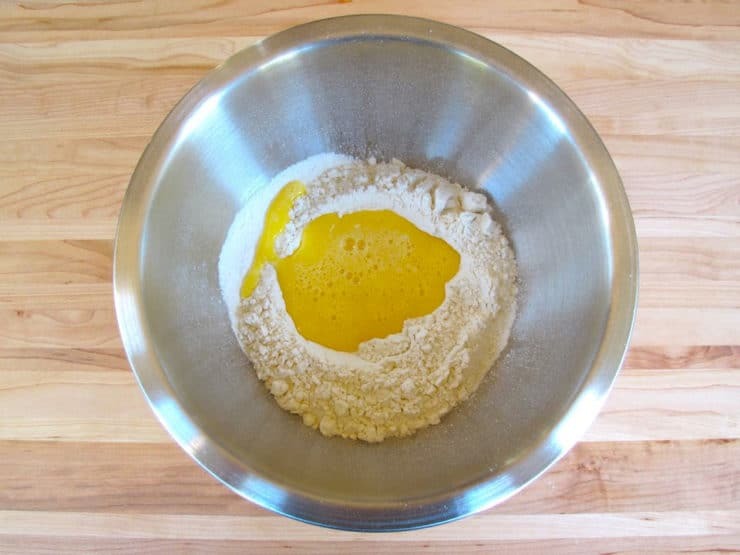 Sift more flour into the bowl, a tablespoon at a time, and continue to stir until a soft dough forms. When the dough gets too thick to stir, use your hands to knead. 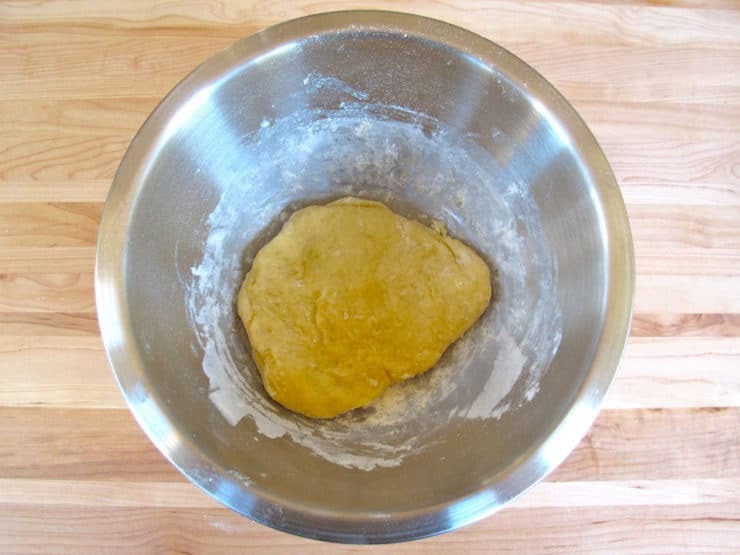 Stop adding flour when the dough holds together and is only slightly sticky to the touch (it will be soft). Let it rest uncovered for 20 minutes. While the dough is resting, carefully strain the broth into another pot through a mesh strainer. Reserve the vegetables; discard the spices and herbs. Skim the fat from the top of the broth and pour it into a bowl. Reserve the fatty liquid (schmaltz). Pull the meat from the chicken in small pieces. 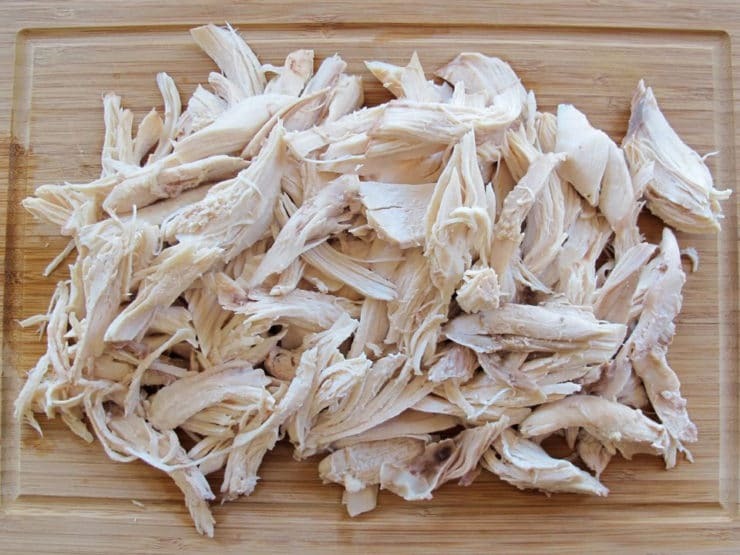 Chop up and measure out 1 1/2 cups of the boiled chicken pieces. 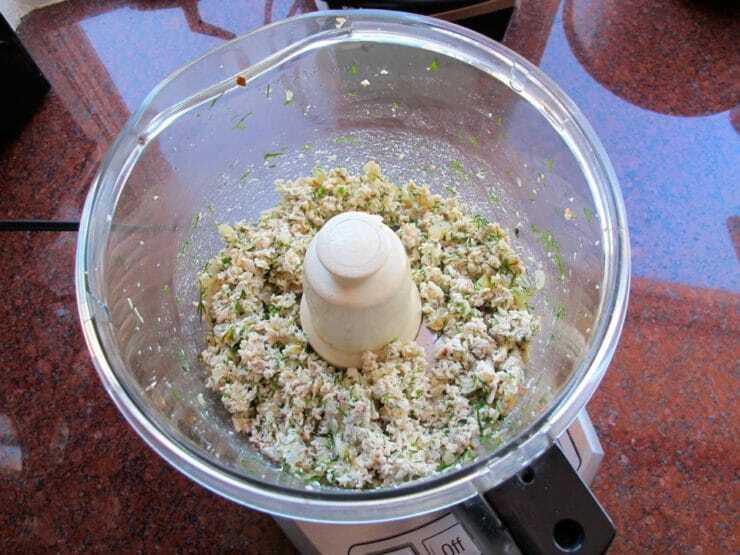 Place the chopped chicken in a food processor. Add the fried onion with its oil, 3 tbsp of the chopped dill, and 2 tbsp of the reserved fatty liquid from the broth to the food processor. If you're feeling indulgent, you can also throw in some of the fatty chicken skin for a more silky filling texture (not healthy, but tasty!). 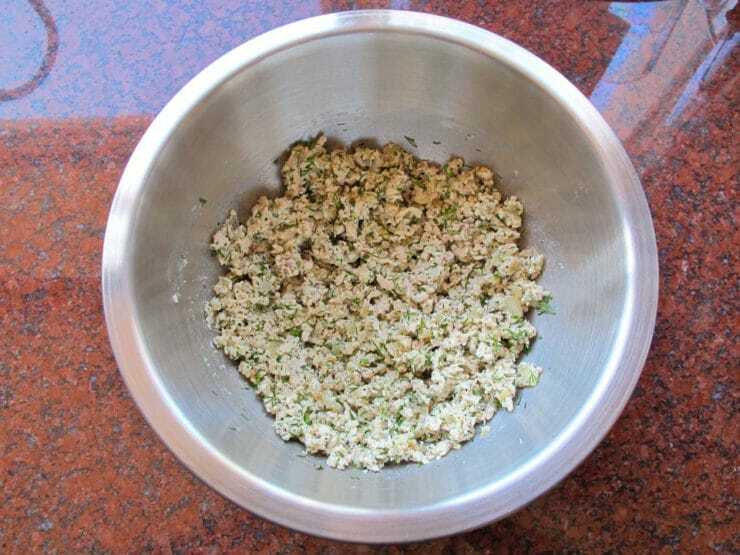 Pulse the chicken mixture in the food processor till it becomes a chunky paste. You will only need to pulse it a few times. Don't over-process it, you don't want a puree-- it should still have texture, like tuna salad. 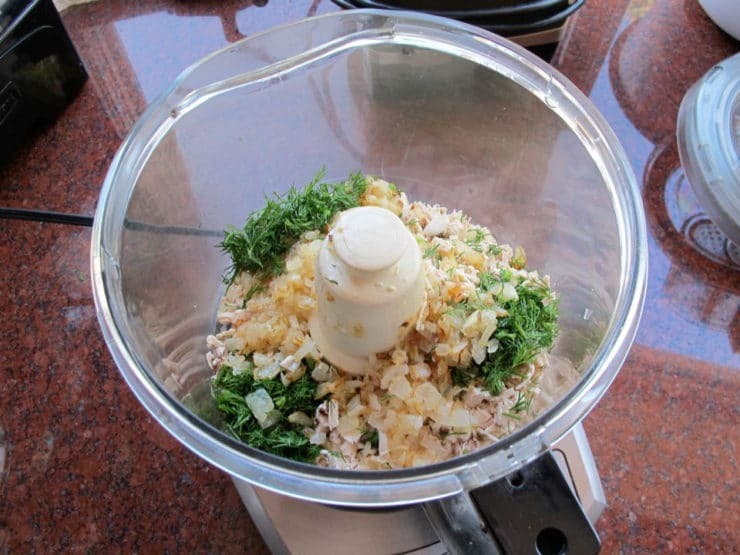 Alternatively, you can mince the dill (and optional chicken skin) by hand, use a meat grinder for the chicken meat, and combine the mixture by hand. Put the chicken mixture into a bowl. Season it with salt and pepper to taste. Don't be afraid to season generously, kreplach can turn out bland if you don't season it well. I like to add plenty of black pepper. Now you are ready to roll your dough. Cover your rolling surface with a thin layer of sifted flour. Scoop up half of the dough from the bowl; cover the remaining dough with a slightly damp towel. Lightly flour your rolling pin. Roll out the dough till it’s very thin, flipping the dough occasionally and reflouring the board and rolling pin as needed. Some people like their kreplach on the thicker side (more dumpling-like), some like it thinner (more wonton-like). For a thicker dumpling texture, roll it out to 1/8 inch thick. For a more delicate texture, roll it out as thin as possible without tearing the dough. I usually stop rolling when the dough is translucent-- when I can almost see through the dough when I hold it up to the light. When it's rolled out thin enough to your liking, it's ready to cut. There are a few different ways to cut and fold kreplach. I'm sharing three methods in this blog; there are other ways too. No matter which fold you choose, keep a small dish of water nearby. 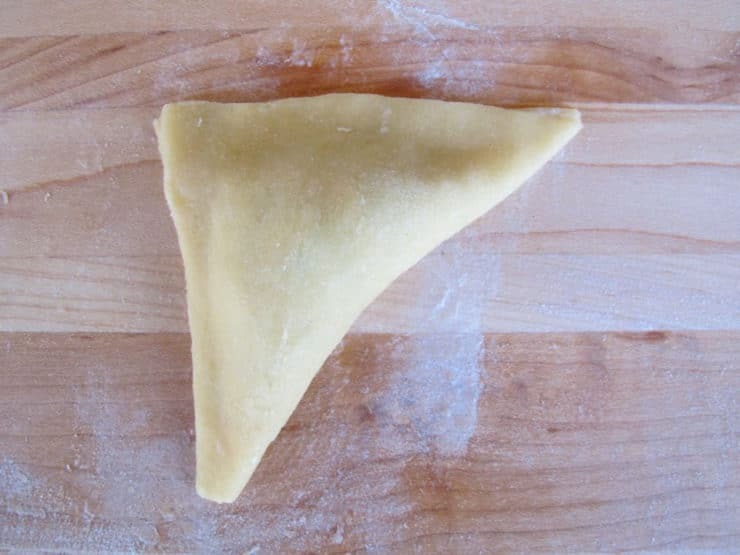 TRIANGLE KREPLACH: Cut the dough into strips 3 inches wide. Cut 3 inch squares from the strips. Gather any remaining scraps and place them in the bowl with the other half of the dough and recover with the damp towel. Place a heaping teaspoon of filling into the center of each square. Wet your finger and run it around the edge of the square. Fold one corner to the opposite corner to create a triangle. Seal the triangle by pinching the seal gently with your fingers. This shape is typically made for the Purim holiday. 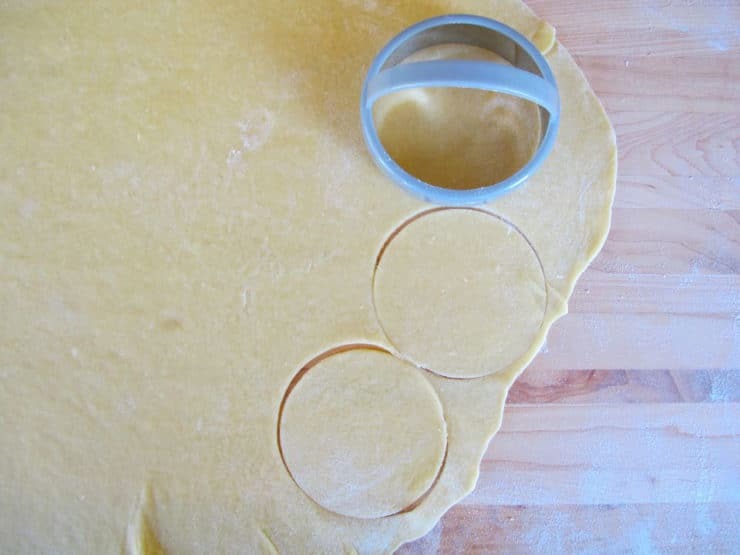 HALF MOON KREPLACH: Use a cookie cutter or the rim of a glass to cut 3-inch circles from the dough. Gather any remaining scraps and place them in the bowl with the other half of the dough and recover with the damp towel. Place a heaping teaspoon of filling into the center of each circle. Wet your finger and run it around the edge of the circle. Fold the circle in half to create a half moon shape. Seal the kreplach by pinching the seal gently with your fingers. Roll the curved edge towards you to create a raised edge around the curve. 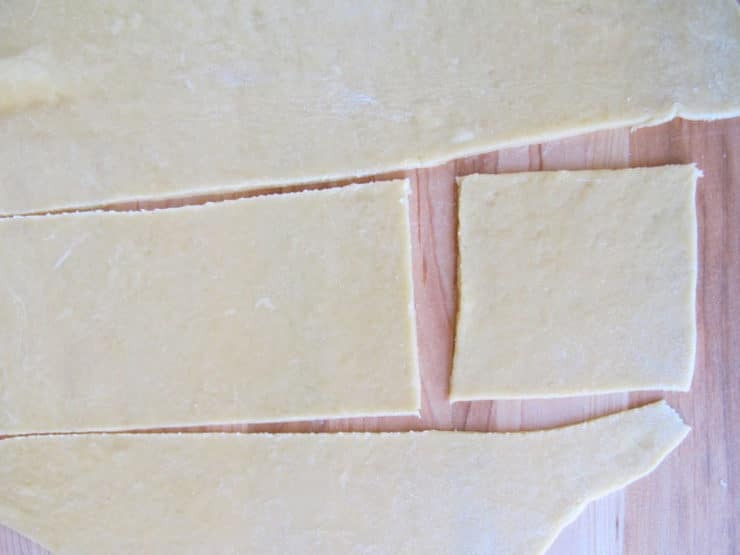 THREE CORNER KREPLACH: Use a cookie cutter or the rim of a glass to cut 3-inch circles from the dough. Gather any remaining scraps and place them in the bowl with the other half of the dough and recover with the damp towel. Take the two upper edges of the circle and fold them together over the top half of the filling. Pinch to seal. The bottom half of the filling will still be visible. Fold the lower flap of the circle up and over the bottom half of the filling. Pinch to create an edge and seal the kreplach closed. Once you've assembled your first batch of kreplach, gather the other half of the dough and the scraps. Roll it out and repeat the cutting and folding process. If you have enough scraps, repeat the process once more. You should end up with 40-50 kreplach (if you rolled the dough out thicker, you will end up with less). 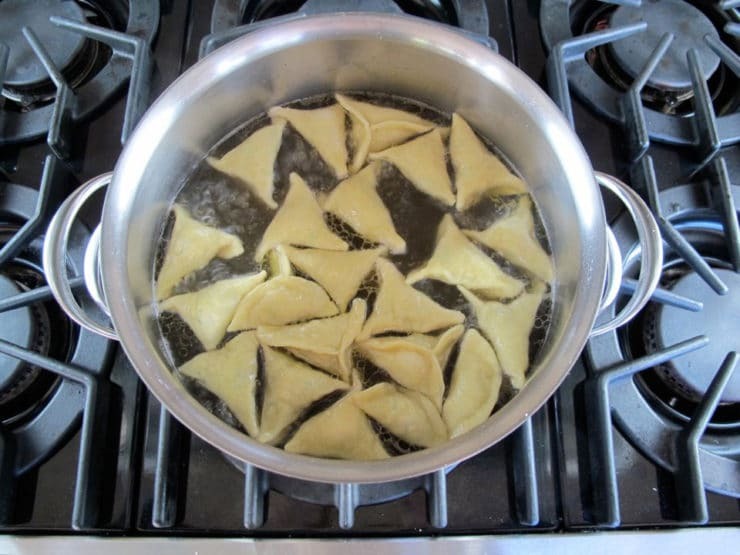 Once your kreplach are assembled, there are two ways to cook them. The most popular way is in boiling water or in the soup broth. 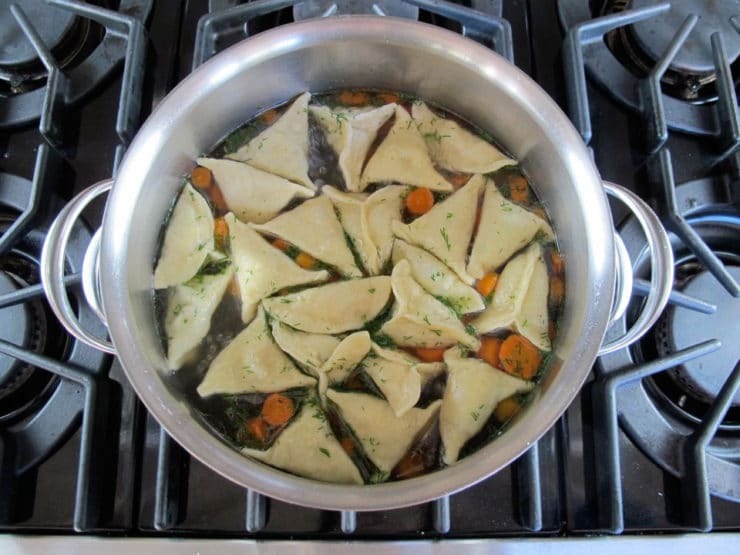 Cook them in boiling water if you are feeding a large crowd; the kreplach will soak up some of the broth, which will make for one or two less servings of soup. 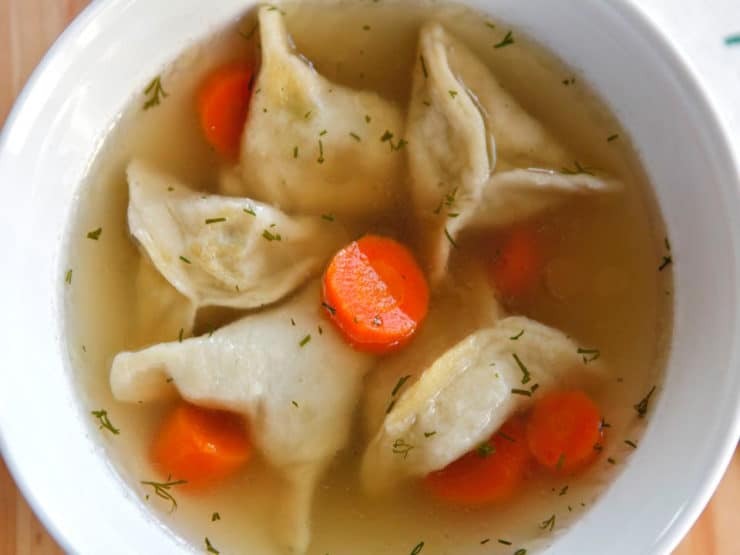 I prefer to cook them straight in the broth so they soak up the chicken flavor-- you may end up with a little less broth, but your kreplach will taste amazing. 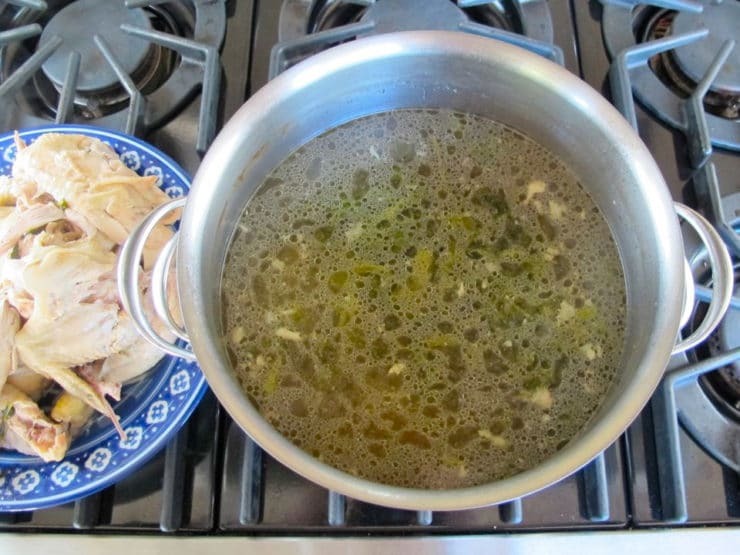 You can always top the soup off with a little canned or boxed chicken broth if you need to. Bring the broth or water to a boil. Gently drop the kreplach into the pot. At first they will sink to the bottom, then they will slowly start to rise to the surface. Some people say to let the kreplach cook till they all float to the surface (which only takes about 5 minutes). I like to cook them for a bit longer-- around 20 minutes-- so they get nice and tender. You can test them to see when they're cooked and soft enough for you. While the kreplach are cooking, chop up the cooked vegetables and add them back to the pot (I usually just use the carrots) along with the remaining tablespoon of chopped fresh dill. You can also add some of the leftover soup chicken pieces, if you'd like. Store any remaining soup chicken pieces in an airtight plastic zipper bag for future use. When the kreplach are cooked to your liking, serve them in bowls of the hot soup broth. Alternatively, you can fry the kreplach to cook them. 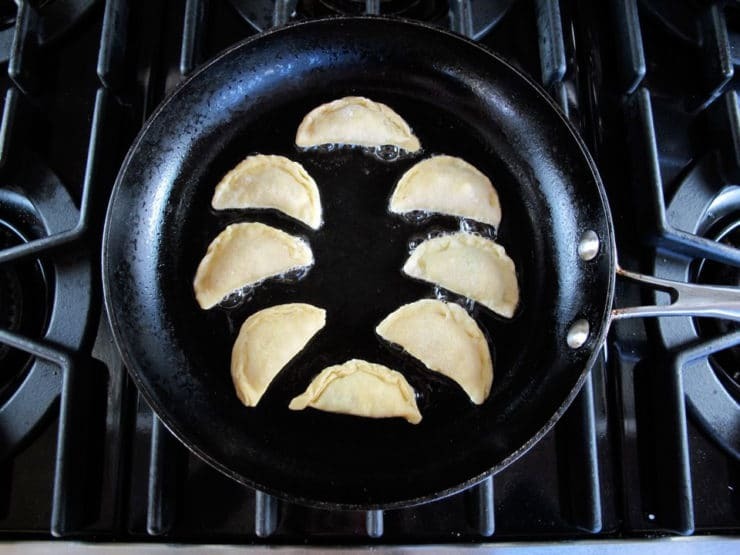 If you want to fry the kreplach, it's best to fold them in either the triangle or half moon shape-- these shapes have a more flat and even frying surface. Heat 1/4 of corn oil in a skillet till hot enough to fry. Keep it on the low end of frying temperature (I usually keep in over medium heat) so they brown, but don't burn. Place the kreplach into the skillet and let them fry on each side till the dough is golden brown and cooked throughout. Serve hot. My husband's family likes to serve the kreplach boiled with a small amount of broth ladled over, topped with melted margarine (or butter, if you're not keeping kosher) and chopped walnuts. It's a Russian tradition from his father's side of the family. No matter how you choose to serve them, homemade kreplach are out-of-this-world delish! Glad to hear this recipe brings back good memories! I love your recipes Tori! You explain how to make them so well. HI Tori! Will this recipe work with oil other than corn oil? We love to try new recipes, and this looks yummy; however, we try not to cook with vegetable or corn oil. Thanks so much, blessings! Hi Tina, of course! Actually nowadays I tend to use olive oil for this; like you, I’m veering away from vegetable oils for most recipes. As an English woman please will you tell me what kind of flour you use. I can see that it isn’t wholemeal but I can’t tell whether it is plain, bread or self-raising. I made the Tori’s slow cooker brisket recipe which was beyond amazing. I cooked it overnight and woke up to and woke to a fantastic smell througout the house. I’m going to use some to stuff the kreplach. I will make my own dough, but I was thinking using chinese wonton wrappers would be a pretty good shortcut. Hi Orna! Cabbage or coleslaw would be a great accompaniment. 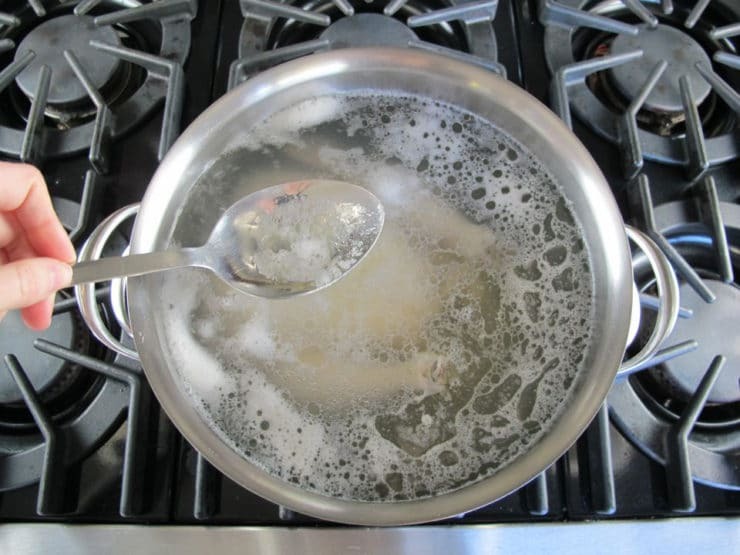 If you plan on frying after boiling, just be sure not to boil them too long– you want them just cooked, not overly tender, or they can fall apart during the frying. Let me know how it goes. Enjoy! Sooo delish! Never made or even tasted kreplach before making this. Followed recipe exactly, wouldn’t change a thing. All I have to say is, thank you. I am not of Jewish descent, but I’ve always been fascinated by the cuisine. I’d never really known what kreplach were, let alone made any. I hadn’t even made pasta before. But, after doing some research, I thought I’d give it a whirl. I found this recipe, and here we are. First, I love the incredible details and amount of photos! I can’t tell you how helpful that was. Second, I was intrigued by the lack of onions in the stock, but you know what? I prefer it! I did add a couple of garlic cloves (guilty pleasure, sorry), but I don’t think that negatively affected the soup. Third, I haven’t really cooked with fresh dill before, but WOW what a flavor it adds! I wish I knew that certain household residents aren’t as big of fans of dill as I am (…hmm…), but I absolutely loved it. Fourth, the service and folding options for the kreplach were easy to follow, and I’m proud to say I successfully carried out the three-corner-hat motif! Again, thank you for the instructions! Lastly, just thanks again for the wonderful recipe and sharing it with us. I feel confident now in undertaking pasta making in general, and I will definitely make this recipe again. For just the two of us, this made a ton of dumplings and stock, so I froze half of the kreplach for a future rainy day. Again, thank you. I felt so wonderful eating this incredible soup and dumpling dish. The flavors were amazing, the outcome was divine, and it is the epitome of comfort food in chicken soup form. Fabulous Art! So pleased you enjoyed this one. Tori, do you think I can make kreplach for Passover using matza meal instead of flour? Would the flavor be pleasing and what about the ease of rolling the dough out. Please let me know what you think about this. Thank you! Hi Jeanie! I highly doubt this will work, unfortunately. Matzoh meal is not interchangeable with flour, swapping it out will rarely give you the same result. I haven’t tried it myself so I can’t say for certain… if you experiment with it, please report back and let us know how it went! Hi! Love your recipes. Does cloves mean garlic or do you mean cloves (clavos)? The dough wouldn’t roll out to be nearly as thin as the dough you have photographed – it kept shrinking back. Additionally, I thought I sealed the kreplach nice and tight, but several of them opened up while cooking in the broth. Hi Emily– hmm, that’s annoying! Next time, make sure your surface is well floured before rolling. Sticking dough will activate the gluten which will cause it to shrink back and give you that pop-open problem. 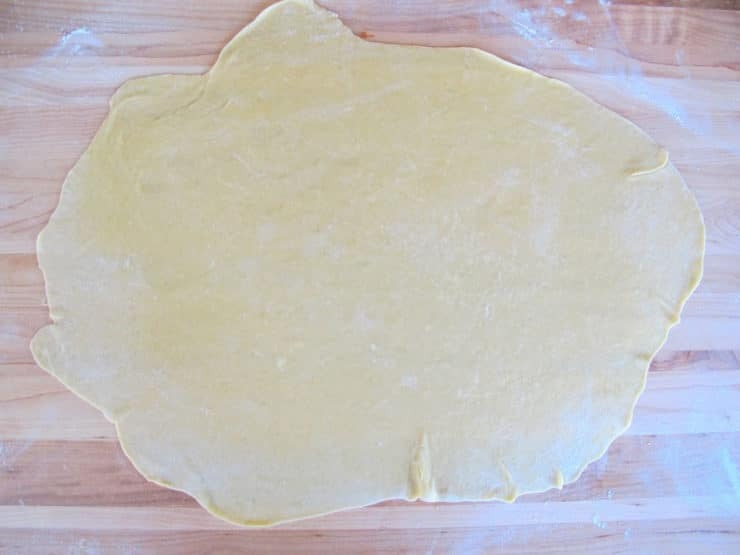 If you find after rolling that your dough seems to be shrinking or pulling, try placing it onto a piece of parchment or wax paper, then slide the paper and dough onto a rimless baking sheet and put it in the refrigerator for about 30 minutes before proceeding. This will give the dough a chance to relax before you make the dumplings. Hi Tori! I cooked the chicken today and would like to make the dough this evening and refrigerate overnight, make the filling tomorrow then roll out the dough, stuff and finish the dish. Is it possible to do the dough this way with good results? And, I imagine I’d have to bring it to room temp before rolling out. Anything else I should do or change? I have little experience with doughs, pastas, etc. Anyone who knows if I can do this with good results (or not), I’d love to hear from you. I’m actually using my Bubby’s recipe to make Kreplech but her recipe does not come with such beautiful photos of each step and how to fold the dough. Thank you! This has been really helpful!! My son and I made schmaltz and kerplach the other day and they were delicious. We’re Scandinavians by heritage but love all good food! Can I freeze them? If so, freeze before or after you cook them? Hi Joyce, honestly I’ve never frozen these but I’ve searched a few forums and it seems they can be frozen either uncooked or cooked. If I were trying it I would probably freeze them uncooked and then cook them from frozen, but I haven’t tried it myself so I can’t make any promises on the result. This was my first time making and eating kreplach, and I must say I’m in love. The recipe was easy to follow and I am super satisfied with the outcome! Can’t wait to share this with others! Miss Tori! Amazing! I have never seen such honesty and accuracy in detail (correctly done) in a recipes’ instructions in my life. Being somewhat new to internet recipe searching and naturally suspicious and skeptical of most information whose source I am unable to verify myself I rarely try or follow anyone’s recipe or instructions to the letter because invariably most lack either professional accuracy or one can easily tell from the ingredients that not only something is missing but that it won’t taste good before you start. Not so here! A novice could follow you and come up with professional results and a professional could LEARN a few things! 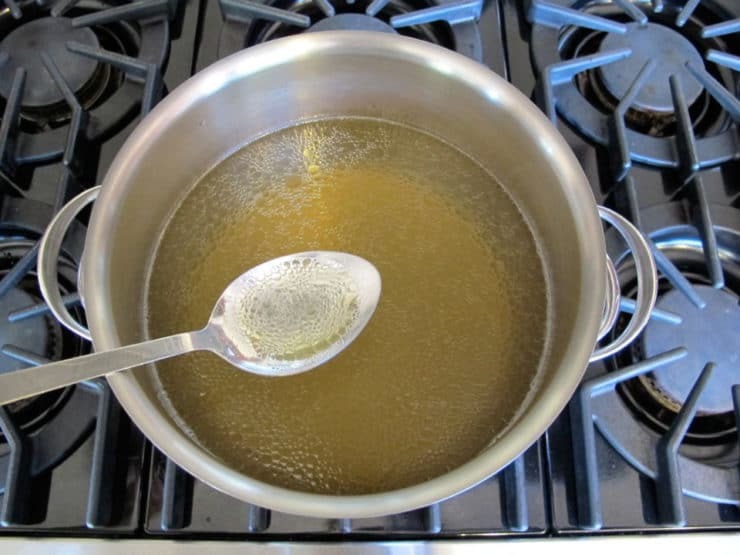 While most will add a little something to give the broth a “boost” that is no doubt common for those who prefer a Traditional style broth I suggest using more backs and necks onions and garlic as well as parsnips as one might in Europe today. You put almost every “Authority” (Martha, Giada, Rachel etc…) to shame with your accuracy and ease of style. I tried these exactly as written (something I NEVER do) and they were PERFECT. You will get more advertising from me telling everyone I know for the next 1000 years than I will have given any other person regarding food or cooking since I have stirred a pot (51 years). I thank you for restoring my faith in the recipes of others and this medium. Krystofyr. You are very kind Krystofyr! Thank you for the glowing review, I am so pleased you enjoyed the kreplach. Both the soup and the kreplach are delicious. Thank you so much for the step by step directions…even I could follow it! I am going to try and freeze the whole pot–soup, cooked kreplach and all, and serve next week. We’ll see…Thanks again. Great Beth! Let me know how the freezing experiment worked. Kreplah or pierogi are bigger in size made with variety of filling (sweet or sour or meat). The one you serving with chicken soup (or sour beet soup, but not borscht ) are being called ” uszka” ; they are very tiny with ground meat and onion – just for one bite. The names vary by region– what you call it will differ from what others call it based on your heritage/ancestry. Hi Judy, my system shows you as subscribed, so you should be getting your first newsletter today. Welcome! I haven’t made the Kreplach Soup just yet but I plan to in a day or two. It truly sounds delish and your photos are awesome. Thanks so much! I had a vague idea about how to make it but Shicksa or not, you spelled it out nicely and gave great tips. Kudos to you! Thanks again. I think I’ll be coming back to your site again. I don’t keep kosher but I miss the foods I grew up on and my area only has one Jewish Deli, but I enjoy making things myself. Hi, this soup looks delicious, can I use chines wrappers they come in small squares and round it will save me time and its u kosher. ty I love your blog! The best food photography I’ve seen on the internet! Now, let’s make sue I have all the ingredients so I can get to work! Love the recipe and instructions. If I want to make ahead and freeze do I freeze before the kreplach are cooked or afterwards? This looks great! Similar to a recipe I got recently from my Jewish father-in-law, except he includes a little beef along with the chicken. Also a lot like a traditional Slovenian boiled dumpling called zlikrofi, which I just made. 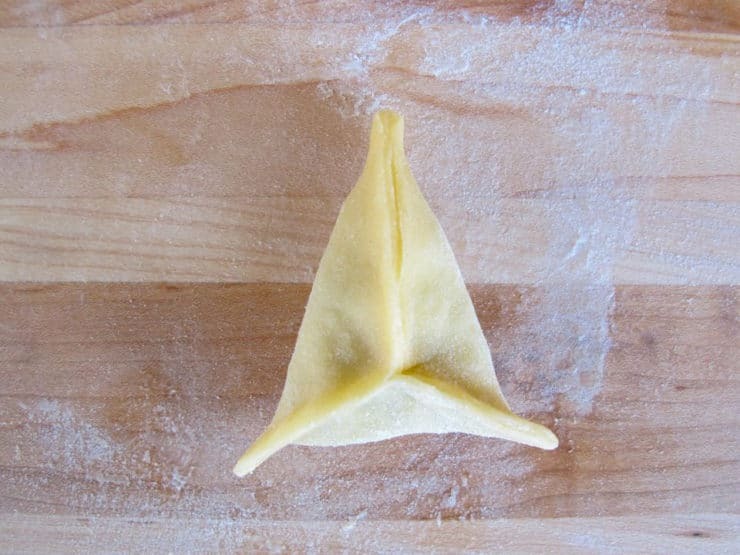 I grew up eating it, but my Slovenian American mom called it wonton or kreplach! Great recipe! 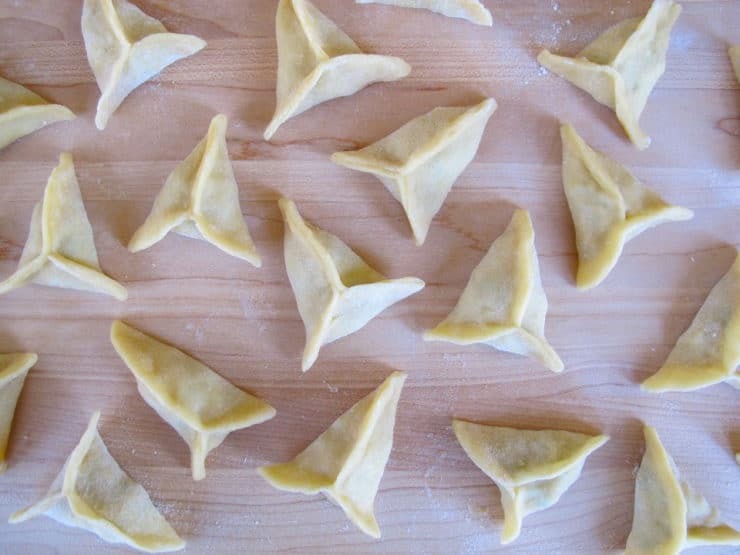 If you want to speed up the process, wonton skins work quite well, too. 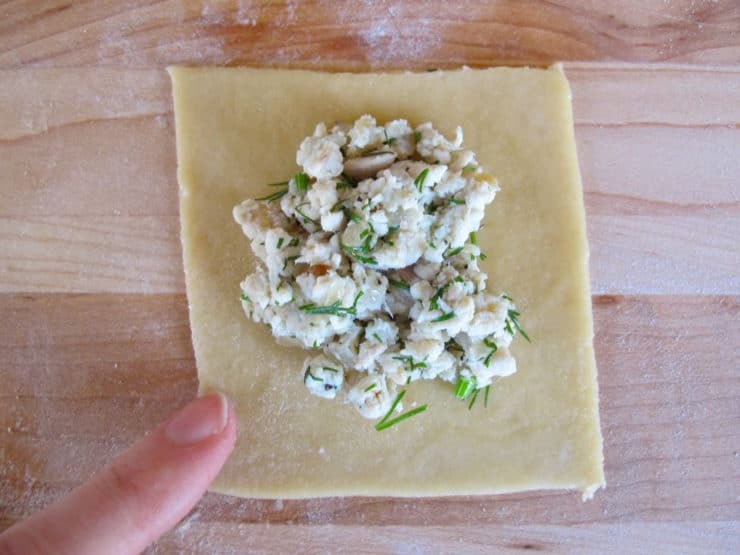 I’m using your recipe for the filling (to use with the remainder of the wonton skins) to make kreplach. I LOVE your blog! I’m also a huge fan of kreplach, but am Gluten-Free. Can you recommend any g-free substitute flours for me that will hold up in the boiling process? very good article the pictures remind me when i lived on long island and it was snowing i used to stop at a jewish deli in plainview and pick up 3 dozen fried kreplach and eat some while sitting in the traffic. Thanks for the great recipe. I do admit though I cheat a little. I use raw won ton dough squares that you can buy in the refrigerated section of a supermarket. I put the filling into these and boiled the won tons according to the package directions. Less mess and fuss. If I want to flash freeze them I just fill them and put them on a parchment lined cookie pan. When they’re frozen I put them in a plastic freezer bag. I take out as many as I want and leave the rest in the freezer for another time I make chicken soup. I love this idea! Just perfect and take out what you need anytime! I thought I was the only one still making kreplach. My mom used to make them, and I guess her mom did too. Now I am a Bubbe and my family waits for Rosh Hashanah for me to make them. 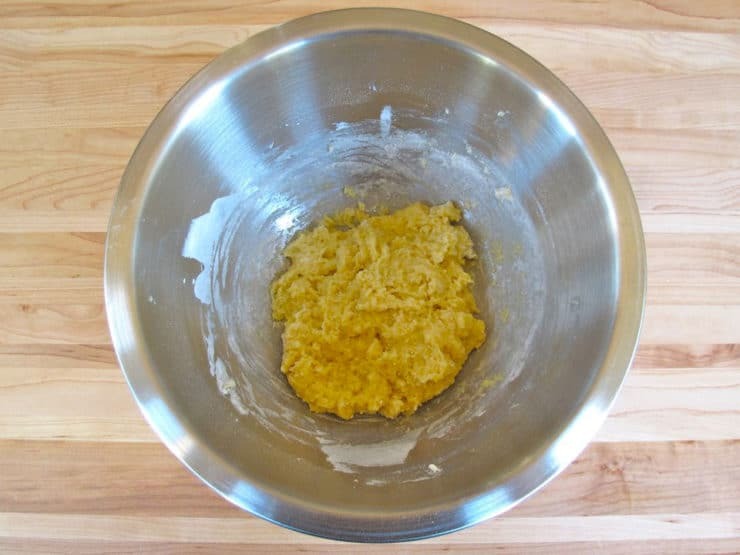 I only use beef, and when I grind the meat in attachment to my Kichen Aid mixer, and then mix the dough in my food processor, I imagine the women who went before me shaking their heads at how much easier I have it! I’ve never made my own kreplach, but now I’m motivated. I LOVE kreplach! My grandmother used to make this amazing beef kreplach that was a special treat. I remember it being time consuming, but SO worth it! I’m not Jewish, but I love the cuisine! This is definitely a recipe I’ll try! Hello, Your recipes look delish! I’ll be trying the hamantashen today with my 3 year old son who just learned in school how to make them. I am wondering if these Kreplach can be made ahead of time and frozen. I made this couple months ago and yes still have some of the krepach stuffed and frozen. They’re like wanton wraps but alittle richer in texture and taste. I def will do extras and store in the freezer for later use. One main tip to freeze these are after making them out place in a cookie sheet flat and freeze for a few hours then you can store them in a zip lock bag. I love-love-love your step by sep photos, and the two ways of folding kreplach is so awesome. Funny how dumplings are an almost universal dish across all cuisines. Great blog and mouth-watering post! What a fantastic blog. I’m glad I found it. As for the kreplach – thanks for the fantastic tutorial. This looks delicious. I think these would be worth the time to make. I have never had them before but they look and sound amazing. Thanks for the history lesson and the wonderful comprehensive tutorial. The soup looks delicious! What do you do with the extra kreplach? Am I correct in thinking they would freeze very well? Girl, you are one of the few people i know besides me who still makes homemade kreplach! Even my Mother would never bother, it went right from my Bubee to me. I have never made them with chicken, i must try that. I always put a little piece of flanken in my pot of chicken soup and use that meat. You never know the beef is there…but yours are a good way to use up the soup chicken. This is something I usually only make for Rosh Hashanah…but now you have given me a craving. I could tuck into that beautiful bowl of soup right this minute! Great pics! Shabbat Shalom! that looks wonderful!! my family came from the Ukraine and my great grandmother made Varenikas stuffed with cherries and also made the Kreplach. Unfortunately she died way before I was born so I didn’t get to taste them. Yours look great. I don’t know if I will make them or not….maybe one day, if I get brave. Hi, Sandi. I came from Kiev Ukraine. And I remember my Babe was making vareniki with sour cherries, you absolutely right and kreplach also. Now thanks to Tori, I will do kreplach. And as soon, as I find sour cherries – vareniki. That’s going to be awesome. And you should try too. Don’t have to be brave, just need time. Shabat Shalom, it is so good to say that to you, my friends. This looks phenomenal! From my Polish side, I’ve always had a fondness for pierogi and even attend the annual PierogiFest just outside Chicago. Definitely reminds me of grandmother’s cooking. (Well, when she actually cooked.) Thanks for sharing!